While wild pigs of different breeds are found in a variety of geographic regions spanning the globe, the conditions of those locations have many things in common. Pigs, no matter what the breed, generally share environmental wants and needs. They are adaptable beasts that can tolerate a wide range of climates. As they are found in nature, they tend to gravitate toward specific environments more than others. 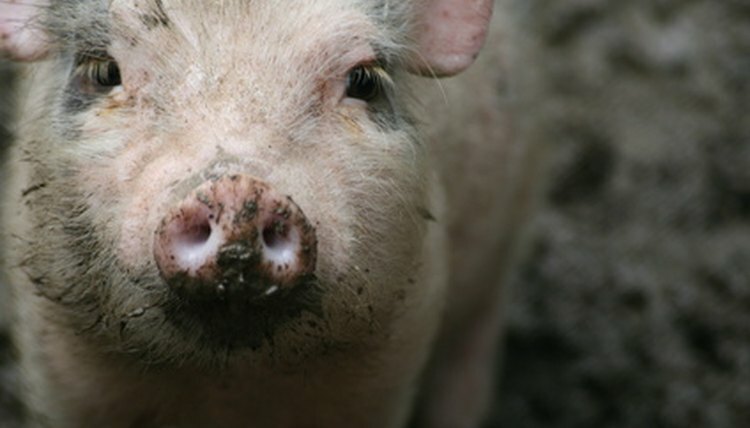 Pigs are adaptable animals that can live virtually anywhere. They make themselves comfortable in climates both warm and hot. As long as they have access to water, food and shelter, they can make do. Pigs don't have many natural predators, and because they reproduce quickly and eat almost anything they can get their snouts around, they are able to adapt to a wide variety of locales. Feral pigs are non-migratory animals, so they inhabit only those regions with favorable climates. In the United States, for instance, feral pigs live in the south and southeast of the country as well as on the California coast. While pigs can tolerate living in colder northern climates -- after all, plenty of pig farms operate in the north -- wild pigs gravitate to warmer areas close to water. Pigs in the wild generally don't live more than a day's walk away from a source of water. Wild pigs in North America are descended from boars that were imported generations ago, so while their breeding may be slightly different from that of their distant cousins in Africa and Asia, they seek out similar environments. For example, wild pigs wallow in the mud as a way of protecting their skin from parasites and the harsh UV rays of the sun. They are natural scavengers with a diet that consists mostly of plants, invertebrates and small mammals and birds. Whether they live in North America or a continent across the globe, then, they naturally stay in environments where these resources are abundant. Wild and feral pigs aren't found just anywhere, despite the fact that they could survive in most habitats. In some states, wild pigs are banned because they pose an ecological threat. For example, in Indiana, wild pigs are a threat to agriculture, livestock, water supplies and wildlife, and their proliferation could cause harm to the local ecosystem. While wild pigs could naturally survive there with the region's natural resources, it would be detrimental to the rest of the agriculture and wildlife. State wildlife services in Indiana and states with similar laws monitor the pig population carefully.